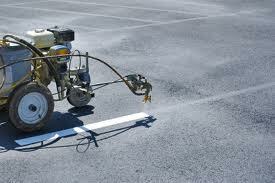 Maintained Striping In A parking lot Will dramatically improve the overall appearance of your facility. and affordable means to refresh the appearance of their properties. Parking lots that are properly laid-out and painted will create a sense of safety and organization for vehicular and pedestrian traffic. Enhances Safety of the Parking Lot — The more clearly marked a parking lot is, the safer it becomes. Bright yellow speed bumps notify drivers that they must slow down. Clearly defined crosswalks give pedestrians a safe passage across busy lanes of traffic. Bright white “stop bars” give a defined place for vehicles to stop. 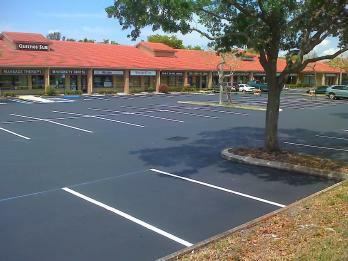 A freshly painted parking lot is a safer place. Controls Traffic — Directional arrows and stop bars can assist you in influencing the traffic patterns and easing congestion. Fulfills All Local Codes and Ordinances — By most city codes, parking lots have some required markings, including fire lanes, ADA (handicap) parking spaces, and stop bars. The law is specific about the parking stall layout, how many are required and where etc. Gold Coast can help you sort through all the red tape and become compliant with the local codes. Gold Coast can stripe new lots, re-stripe your existing lot, change the layout to meet new code requirements or ADA requirements and of course stripe after sealcoating. We also paint tire stops, curbing, sidewalks, bollards, lightpole bases and any other parking lot features you need painted. Call us today for all your striping needs!